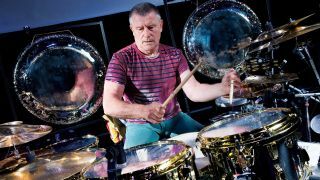 Carl Palmer is kicking the year off in style by launching a new art project - and you can win one of his art pieces! The legendary sticksman has teamed up with SceneFour to produce the Twist of the Wrist collection. Of the collaboration, Palmer said: "I have been extremely interested in modern art since my earliest days in ELP, but I never envisioned myself as someone who would create it. SceneFour has enabled me to combine the two things I am most passionate about - fine art and music." Fancy having a Palmer original hanging in your living room? Well, we have one of Carl's Stones of Years lithos to give away. To stand a chance of winning just email rhythm@futurenet.com with the subject line Carl Palmer Art. One winner will be chosen at random. Competition closes 10 February 2014. Check the full collection here. Palmer is also taking his Twist of the Wrist tour on the road through January and February. The 14-date tour, on which Carl will be performing his ELP Legacy show, kicks off in Hull on 24 January and concludes on 1 March in Fletching. For more details on Carl's art collection check www.carlpalmerart.com, and for full tour information head to www.carlpalmer.com.